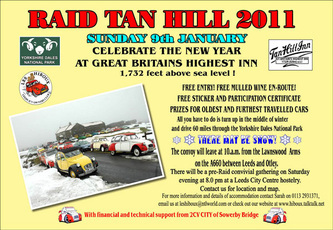 Raid Tan Hill 2011, Sunday 9th January. 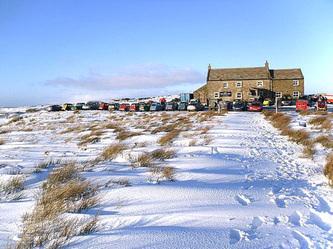 Celebrate the New Year at Great Britain’s highest inn. 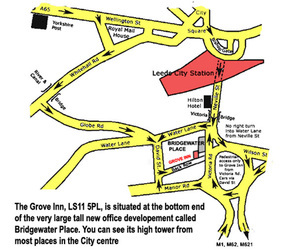 On the Saturday evening before the event, starting about 8.0 pm, there will be a convivial gathering at the Grove Inn in the Leeds City centre. 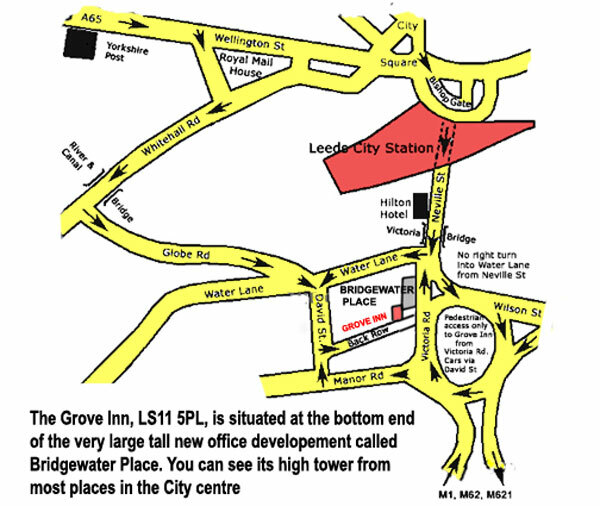 See attached map. The event itself starts early on Sunday morning at the Lawnswood Arms on the A660 Leeds - Otley Road. 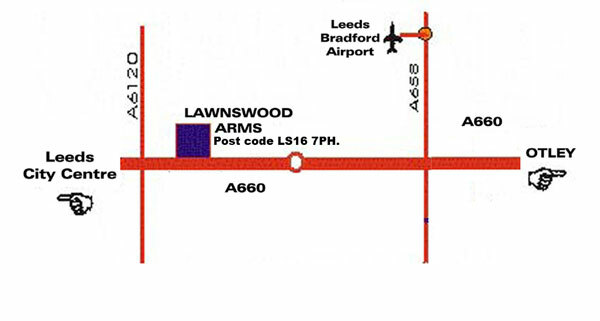 Post code LS16 7PH. 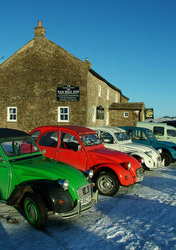 The pub opens its doors at 8.30 a.m. to provide tea, coffee and bacon/sausage butties. 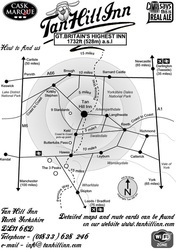 Having taken on sustenance for the task ahead we leave the pub at 10 a.m. and set off in convoy on a 60 mile spectacular route through the Yorkshire Dales National Park. Along the Wharfedale Valley, then Upper Wharfedale, through Langstrothdale, over Fleet Moss, at 1932 ft above sea level the highest point of our journey, down to Hawes, where we have a twenty minute break for a glass of mulled wine, then onwards over the Buttertubs Pass, through Thwaite and Keld, up the fearsome Keld Bank and finally over the moors to Tan Hill. Arriving at Tan Hill at aprox. 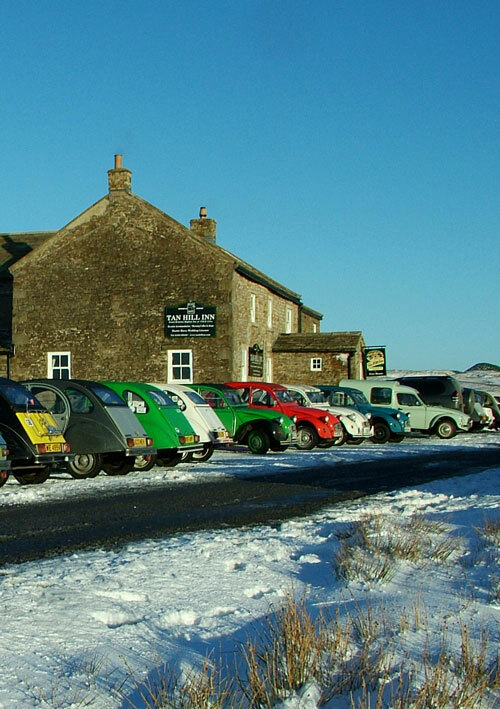 1.30 pm we have exclusive use of the pub’s heated barn, lunch is available from a special Raid Tan Hill menu, there will be 2CV videos on the large screen, and we finish with our famous free raffle at about 3.0 pm. 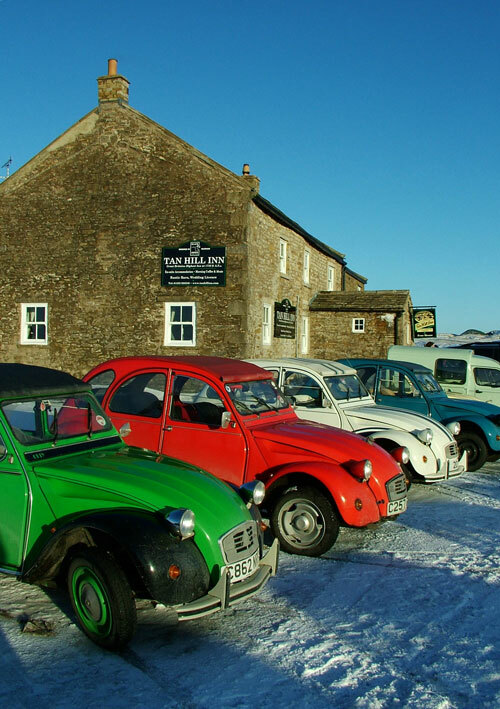 Every driver completing the route from the Lawnswood Arms to the Tan Hill Inn receives a certificate and a sticker, with special ones for the oldest car and the furthest travelled. 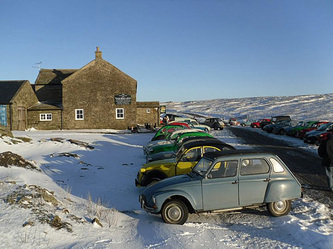 A midwinter trip to Tan Hill is always a challenge, whether it is on foot along the Pennine Way, which passes the door, or in the relative comfort of a small, air-cooled, two cylinder, French motorcar. With its 1 in 4 ascents, steep descents , narrow roads and the possibility of snow it is not for the faint hearted. Raid Tan hill 2011 was certainly different! After a damp start on Sunday morning the weather turned clear and sunny and by the time we got to Buckden it was beautiful. Magical scenery with blue skies and snow. 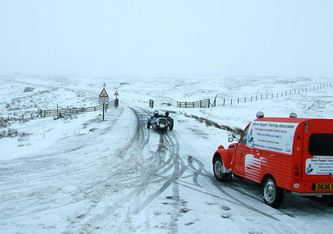 The road over Fleet Moss was still closed by snow so we had to put Plan B into action and change the rest of the route. After an attempt to use the local car park was thwarted by inch thick sheet ice we stopped for a welcome cup of mulled wine and a piece of stollen cake.in a lay-by a few miles further on . 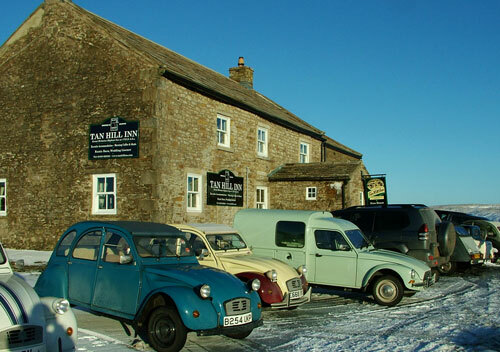 The roads from Leyburn, over Grinton and up from Reeth were still well covered with snow but everybody eventually made it up to the Tan Hill Inn, some with more difficulty than others! This was the only road still open, several cars trying to get in from Kirkby Stephen finished up stuck in snow drifts and nobody even attempted to come over from Keld. After lunch in the barn the certificates and raffle prizes were given out and at about 3.30 pm everybody not staying overnight set off on the long journey home. Considering the conditions it was amazing that over sixty vehicles made the trip. 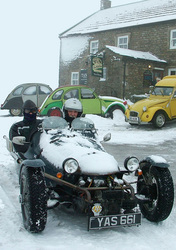 The prize for oldest vehicle went to Scott Vaughan with his 1969 AK350 and farthest travelled was Wendy Griffiths and Andy Moore at 339 miles. Unfortunately they were involved in an accident on Monday morning at Reeth and although not hurt they had to be taken back to Portsmouth on the back of a pickup truck! Needless to say that those of us who stayed over on Sunday night woke up on Monday morning to fierce winds and more snow! 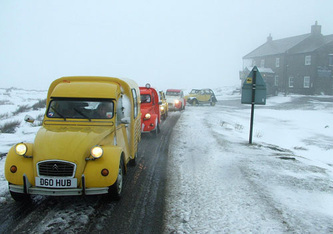 Thanks to everybody who helped to run the event and especially Tony Shields of 2CV City whose continuing financial support enables us to keep Raid Tan Hill a free event and also fulfilling his support role by pulling several vehicles out of snowdrifts and providing batteries and jump leads for the 2CVs that had starting problems after been parked out in the wind and snow all night. And finally to Tracy and all the staff at the Tan Hill Inn for once again making us so welcome. So thanks to everybody who came and we will see you all again at Raid Tan Hill 2012.